While I might initially object to the distraction of video clips in the middle of fiction narrative, I have to remind myself of how many times I've been pulled out of "Bleak House" or "Nicholas Nickleby" by the marvelous illustrations of Hablot Browne (aka "Phiz"). Perhaps video is the new engraving. Given my newfound enjoyment of e-books on the Kindle, I'm more than open to the possibility of reading e-only books. As the world (according to Thomas L. Friedman) continues to flatten, this will inevitably mean staying open to the occasional self-published book. But I'm okay with that. I'll just continue to apply the same standard I do to those "old-fashioned" books that smell like Grandma's kitchen: it's the content that matters, not the means of delivery. Well, as we have seen in previous posts, the “means of delivery” does matter — more for some books than for others, and not absolutely, but nevertheless: the form of the book counts. Still, I’m interested in this comparison to illustrated Victorian novels. 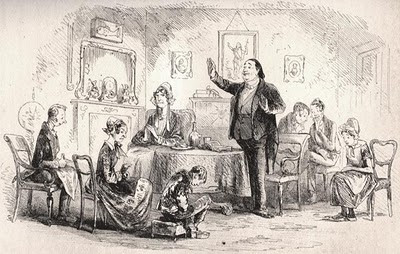 Phiz’s illustrations of Dickens were for many Victorian readers (and are for some modern ones) co-extensive with the novels themselves. Similarly the Pauline Baynes illustrations of the Narnia books, and Quentin Blake’s of Roald Dahl’s stories. I can imagine future readers for whom embedded videos in novels have similar associative power. I wonder if some filmmakers will attach themselves to particular novelists, creating future versions of the Boz/Phiz collaboration. We've already got movie-trailer-style videos as commercials for books. I can see a future in which many novels open or close each chapter with a video. What I like about this notion is that, if pursued with spirit and openness, would open up new expressive possibilities for the moving image as well as text.